Vietnam is a very beautiful, peaceful country in Southeast Asia. 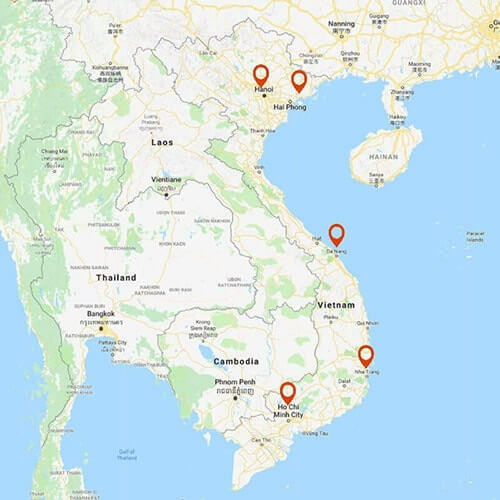 Our 15-day Family Holiday Tour of Vietnam is ideal for those travelling as a family with children as it is light with entertainment activities for whole family members. Your children will have more time to relax as well as discover new things in Vietnam. This tour is designed for all members in family: discover the best beaches in Vietnam and famous islands, beach towns and urban landmarks. The kids will love the cooking classes mixed with just enough of the historical & cultural sightseeing. Welcome to HO CHI MINH CITY, formerly Saigon. You will be welcomed by our Asia Senses tour guide at the Tan Son Nhat International Airport, then transferred to hotel for check in. Depend on your actual arrival time, some soft sightseeing for an orientation tour is suggested. In the evening, enjoying your welcomed dinner on Saigon River Cruise. This morning, our guide will take you to visit the historical landmarks of Saigon City. Start our tour with a visit to Reunification Palace - the former Presidential Palace for the president of the South of Vietnam until end of April 1975. After that, visit War Remnant Museum, or the History Museum or “Museum of American War Crimes”. It houses and exhibits a shocking reminder of the long and brutal Vietnam War. Also visit other French colonial structures including the Notre Dame Cathedral, the Old Saigon Post Office, Saigon Opera house. They were built in period of French colonial in Vietnam (1887-1945). Taking photos and get good shots of this biggest city in Vietnam. Have lunch at a restaurant in city center. After lunch, continue to Binh Tay Market (or Cholon Chinatown Market), to discover the area’s markets, shops, and the Cantonese Thien Hau Pagoda. From here, proceed to visit the Museum of Traditional Vietnamese Medicine - Vietnam's first traditional medicine museum, with an stunning collection of 3,000 items relevant to the development of traditional Vietnamese medicine. Implements used to prepare indigenous herbs, and objects commonly found in traditional pharmacies can be seen in the ancient books and documents as well as galleries on traditional Vietnamese medicine. Return to the city centre to visit Ben Thanh Market where an incredible display of fresh produce is offered. Enjoy a stroll through the market, exploring the variety of goods for sale. After breakfast, depart Saigon for a short transfer to Cu Chi Tunnels. We will drive through peaceful countryside of Vietnam. Along the road, there are rubber plantations and rice paddies. Cu Chi Tunnels Historical Site is a famous tourist destinations in Vietnam. This vast network of tunnels was built by the Vietnamese soldiers (Viet Cong) during the battles that took place in the Southern of Vietnam. The tunnel is over 120 km in length which is an intricate network of interlinked multilevel passageways at times stretched as far as the Cambodian border. The tunnel complex contains meeting rooms, kitchens, wells, clinics, schools, depots, trenches and emergency exits all aimed for guerrilla warfare. If you want, you can crawl inside the Cu Chi Tunnels. You also could try gun shooting at Cu Chi shooting range. It would be a memorial experience in your trip. After the Cu Chi Tunnels visit, stop by a local restaurant for lunch before we heading back to Ho Chi Minh City (HCMC). Free at leisure. This morning, our guide will meet you in the hotel lobby then transfer you for a short scenic drive to the MEKONG DELTA. It takes about 02 hours to drive from HCMC to Cai Be District. Upon arrival, board a boat for a river cruise journey along the endless waterways of the mighty Mekong. You will experience lively Cai Be Floating Market where local people buy and sell their fruits and vegetables. On the way, we also visit a traditional brick factory where locals still use traditional method to make brick and pottery. Afterwards we will halt at a small restaurant where you could taste local delicacies of river. Later, arrive at the lush orchards which is located on small island of Mekong river. You can walk around the garden, chat with locals and watch their daily life. Toward the end of the day, spend the night in a homestay with a local family. Today, continue to explore the Mekong Delta. 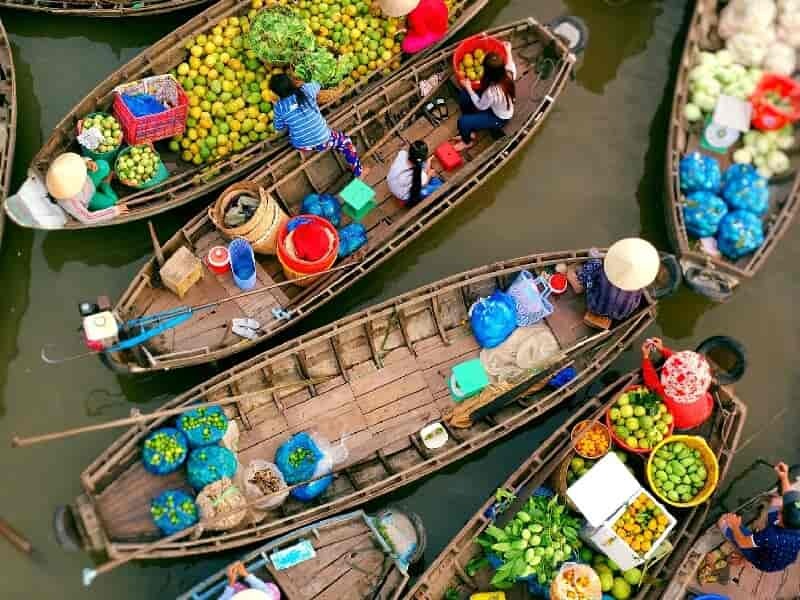 Join with local people to buy special fruits or other souvenirs in local floating markets. Afterwards, continue our boat trip along the maze of waterways and canals, travel through through An Binh Island, observe daily life of local people. Then make a stop to visit an old traditional house with a bonsai garden, followed by a stopover at some of the local traditional industries: pop rice, rice paper and coconut candy workshop. 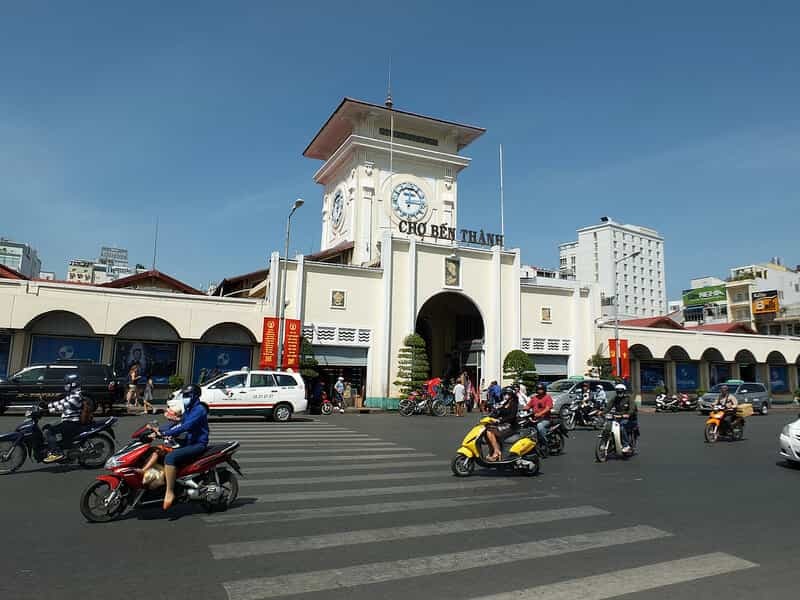 Following the cruise, return to the pier in late afternoon where the driver is ready to transfer you back to Ho Chi Minh City. Overnight at hotel in Ho Chi Minh City (HCMC). In the morning, take a short domestic flight to NHA TRANG. Upon arrival, our local guide and driver will be awaiting to pick you up. Ride cable car or speed boat to Vin Pearl Island where you can entertain yourself at the Vinpearl Land Amusement Park. Check in your hotel then free to relax at beach or swimming pool. Spend the whole day to entertain at the park. Free entrance fees for all items in the park, you have time to experience with indoors or out door game, Vinpearl Water Park, Vinpearl Underwater World….. 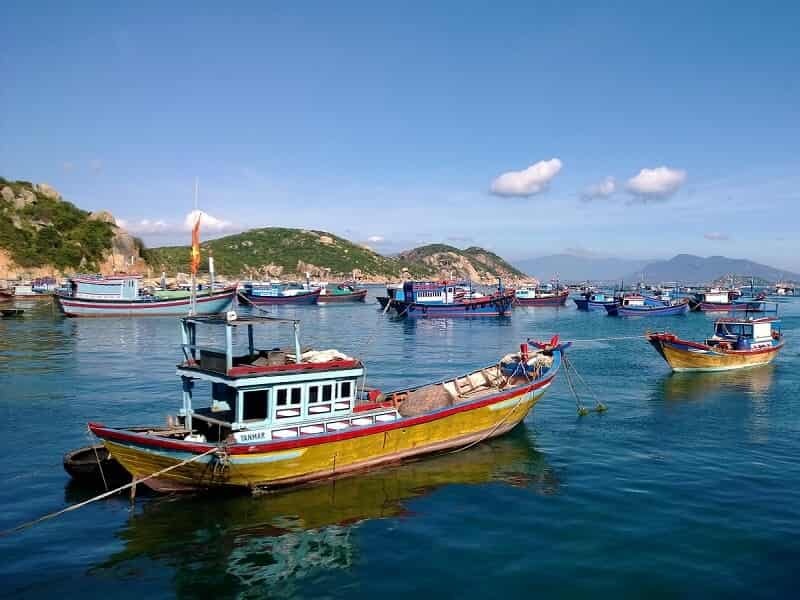 This morning, take a short transfer back to the shore to visit the Nha Trang Oceanographic Institute to see the whole collection of fish, stuffed birds and sea mammals of Vietnam sea. Located about 5km from city center, the museum is one of the very first centres for scientific oceanographic research in Vietnam, currently storing and preserving specimens of 60,000 of marine species. After that, visit Long Son Pagoda, Chong Promontory Rocks, Stone Church and the Po Nagar Temples. In the late afternoon, pay a visit to local Dam Market. Here, wander and explore the daily life of Nha Trang inhabitants. We suggest you to return Dam Market in next day early morning (about 4:00 AM), when you could experience this lively market at its best. It offers many photography opportunities with various merchandises while visitors can witness its hectic pace and atmosphere buzzed with activities. Today, transfer back to the Cam Ranh Airport for the domestic flight to DA NANG. 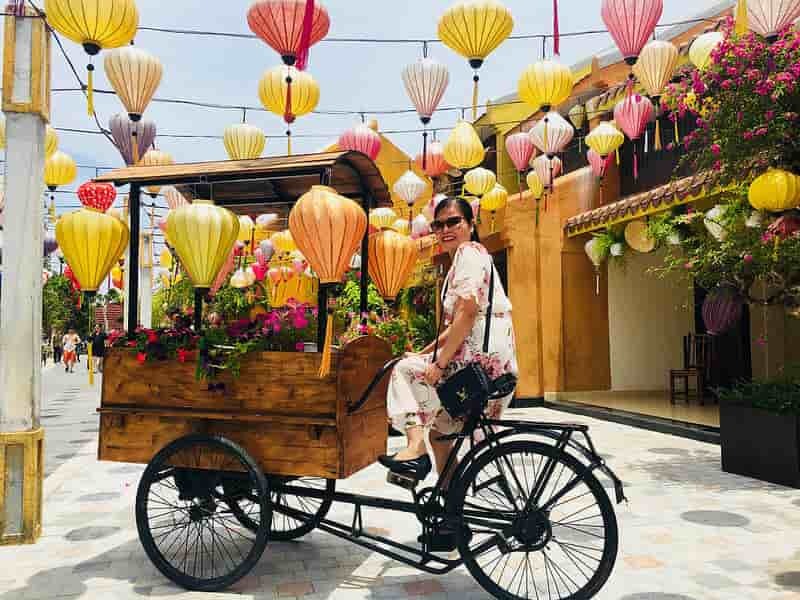 Upon arrival, our local guide and driver will take you on a short transfer to Hoi An Ancient Town. Check in and spend time for refreshment. In the afternoon, begin with a walking tour of Hoi An’s ancient quarter which covers all highlights in Hoi An. Our first destination is Japanese Covered Bridge which is Hoi An’s iconic 400-year-old. There is a small temple attached to one side as a prominent example of Japanese architecture. Next, head to Ong Temple which was built in 1653 by Chinese settlers to worship Guan Yu, an ancient Chinese general whose character stands for loyalty, bravery and justice. Museum of Trade Ceramics is our next destinations. It is an elegant Vietnamese style wooden house which was built in 1858 showcasing antique ceramic artifacts. Then we will visit the 200-year-old Tan Ky House which was the residence of a Chinese merchant in the part. Then we walk back to your hotel. The rest of the day will be yours to explore at your leisure. This morning, you will take off on a half day trip to My Son Sanctuary, another World Heritage-listed site. Considered one of the best-preserved Cham centers in Vietnam, the site is the former capital of the ancient Cham civilization that ruled Central Vietnam from the 2nd to the 13th century. There are 20 monuments still standing today, set in a verdant valley surrounded by hills and overlooked by massive Cat’s Tooth Mountain. Stroll around the temple complex to learn about the Cham culture, architecture and civilization before come back to the Hoi An Old Quarter before noon. Have lunch then rest at your hotel. 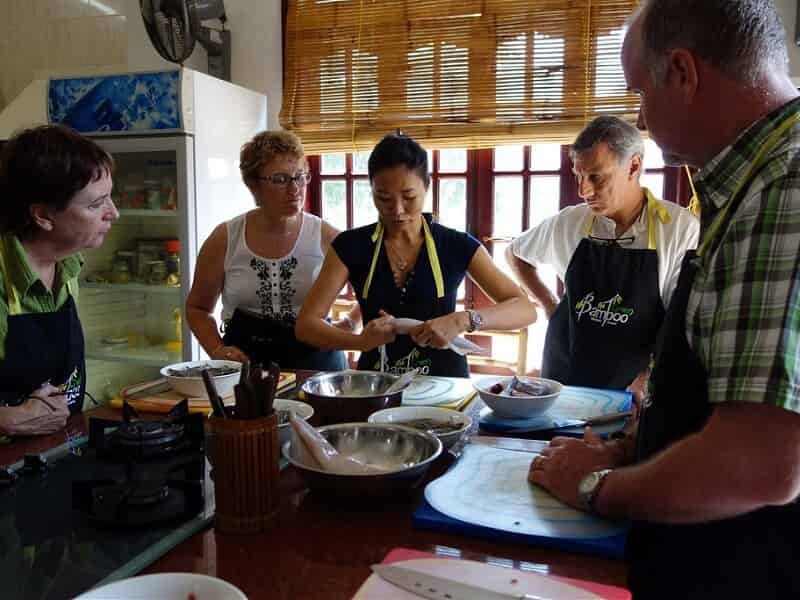 In the late afternoon, a guide from the local cooking school will take you on a tour to Hoi An Market to learn about the ingredients which be used in your recipes. Walk through the market, observing the colorful daily life of local people. After that, embark on a boat ride along Thu Bon River for about 25 minutes, watching local fishermen casting nets as part of their daily routine. Arrive at a small township and walk to the cooking school. The cooking class starts in an open-air pavilion by the river under the instruction of an experienced chef. Observe, practice, sample and bring out a good dinner cooked the local style to your own taste. Enjoy dinner with what you have made by yourself. In the morning, free at leisure to walk and explore the ancient town at your own pace. 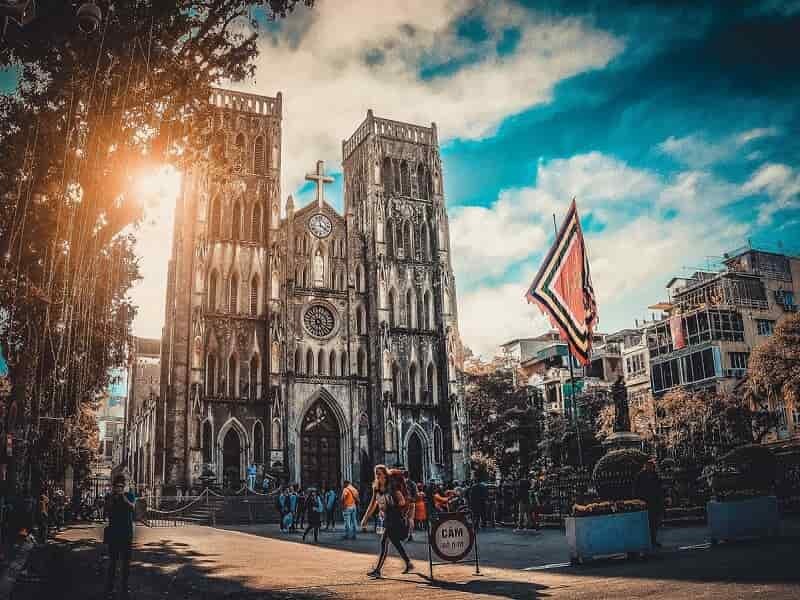 Afterwards, you will be transferred back to the Da Nang Airport where you embark on an afternoon flight to Hanoi, the capital metropolitan of Vietnam. Upon arrival, our local guide and driver will be ready to transfer you to hotel for check in. OPTIONAL: In the evening, join us for a night street food tour around the streets in the Old Quarter. There is a chance for you to taste delicious street food of Hanoi such as: Bun Cha, Spring Roll, Pho… with a cup of Bia Hoi (or draft beer). Do as the locals do and pull up a stool and enjoy a drink while watching the world go by. After the breakfast, begin the exploration in Hanoi with a chance to sample the fresh aroma of Vietnamese coffee, filled with rich dark roast that fills you with flavorful energy for the whole day. The tranquil quarters of Hoan Kiem Lake provide you with a local getaway within the dangling greenery that almost blocks the remaining city. Stop at the monumental Ho Chi Minh Mausoleum, which houses the embalmed body of the communist leader in a glass coffin then the wooden stilt house where the president Ho Chi Minh resided in his later years. Nearby you can see the One Pillar Pagoda, founded by fatherless King Ly Thai Tong in 1049. NOTE: Sites in the Ho Chi Minh Mausoleum Complex are viewed from outside; closed on Mon and Fri and from October - November. Depart for a visit to the Temple of Literature, Vietnam’s first university. Founded in 1076, the site, initially named Quoc Tu Giam, was established within a temple to educate Vietnam's royalty, mandarins and members of the elite. The university functioned for an incredible 700 years and its gardens and well-preserved architecture offer a fascinating glimpse into Vietnam’s past. 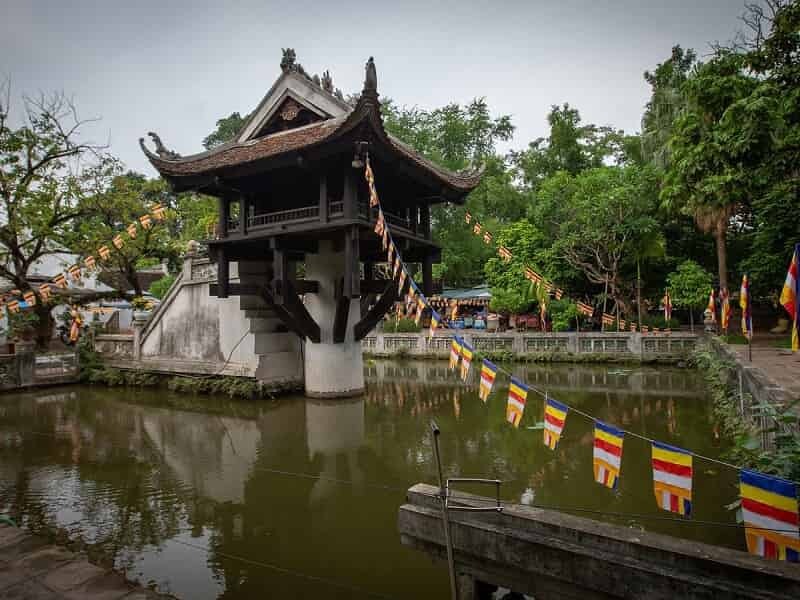 After lunch, follow your guide to the 11th century Tran Quoc Pagoda, Hanoi’s oldest Buddhist temple, originally built in the sixth century, and the Taoist Quan Thanh Temple. Travel back to the Old Quarter then visit the lakeside Ngoc Son Temple, dedicated to the 13th century national hero Tran Hung Dao which stands along the lake’s edge at the center of Jade Island. The temple is connected by a scarlet bridge that gracefully arches over the water. Throughout the day you will find the fascinating history of Hanoi, diverse cultures within the modern streets, traditional shop-houses, temples and countless cafés and bars. Finish your day off at Bong Sen Opera Theatre for a traditional Vietnamese water puppet show, a typical northern Vietnamese art form. Following breakfast, leave Hanoi for the 4hr drive towards HALONG BAY, travelling through the rich farmlands of the Red River Delta. Upon arrival around noontime to Halong City’s pier, check in formalities and board one of the best Vietnam luxury cruises on the emerald green waters of beautiful Halong Bay, a UNESCO World Heritage Site, dotted with more than 2,000 towering karst islands topped with dense jungle foliage. 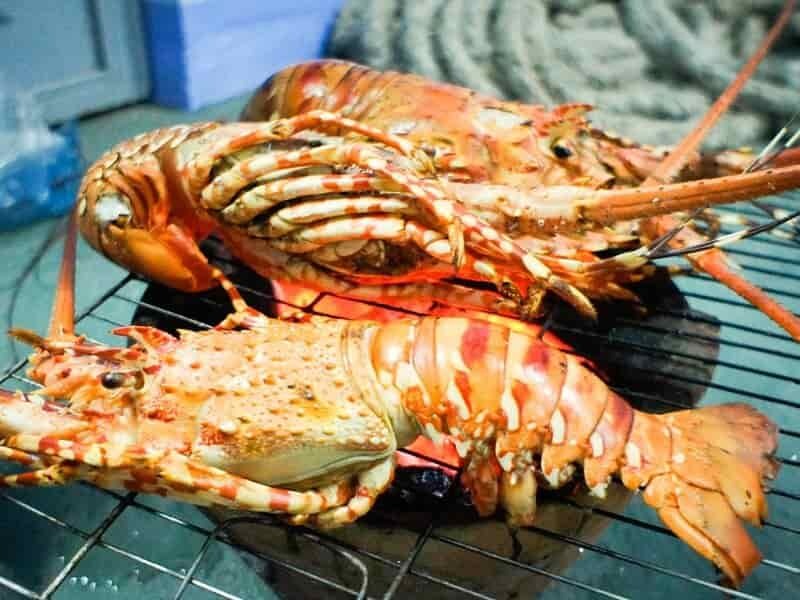 Lunch (with fresh seafood) will be served on board while cruising into the bay. 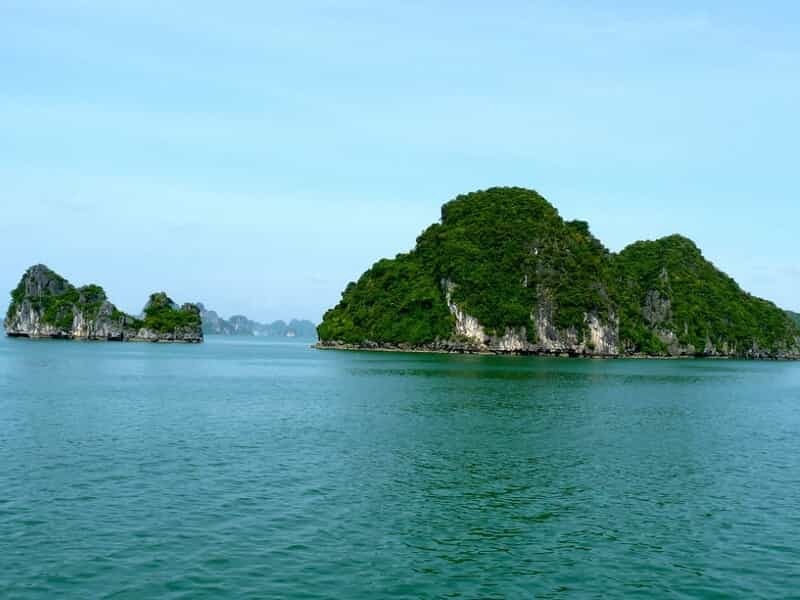 In the afternoon, you will visit one of the famous caves of Halong Bay: Dinh Huong Island, Ga Choi Island, Dog Island, Sail Island, a visit to Sung Sot Cave. There is also a stop at Ti Top Mountain, where you will climb to the top for a stunning panoramic view of Halong Bay. Then you return to your boat. Relax to enjoy the bay view at sunset, have your delicious dinner. Wake up early and refresh your body and mind with a Tai Chi exercise on the sundeck. Have tea and coffee onboard and watch the stunning views of Halong bay. There will be an opportunity for you to kayak, swim or access some of the sites inaccessible by the larger boats, including a cave. Lunch will be serviced on board before the cruise arrival back at the dock where you will be picked and be transferred back to Hanoi by private car. Your family holiday in Vietnam comes to an end today. Free at leisure until our guide and driver pick you up then transfer you back to the Noi Bai Airport for your onward flight. We thank you for travelling with us & look forward to serving you again in your next journey to Vietnam. You may consider other exotic destinations that we have expertise in such as China, Japan, Bhutan, Indonesia or even North Korea.